My little guy starts Kindergarten in two and a half weeks. We actually just got the school district calendar in the mail, and my husband and I spent a good thirty minutes geeking out over all the elementary activities and family picnics and extracurricular activities at the beginning of the year. Kindergarten Barbecue?!? Annual Carnival?! Circus Day?! Family Bowling Night?!?! Parents&apos; Night Out!?! Sign. Us. Up. Especially for that last one. Of course, my big man on campus needs to have a fitting wardrobe for all these awesome academic events! Good thing I&apos;ve found a few adorable options that are perfect for the first day of school, the homecoming parade, picture-day and beyond! 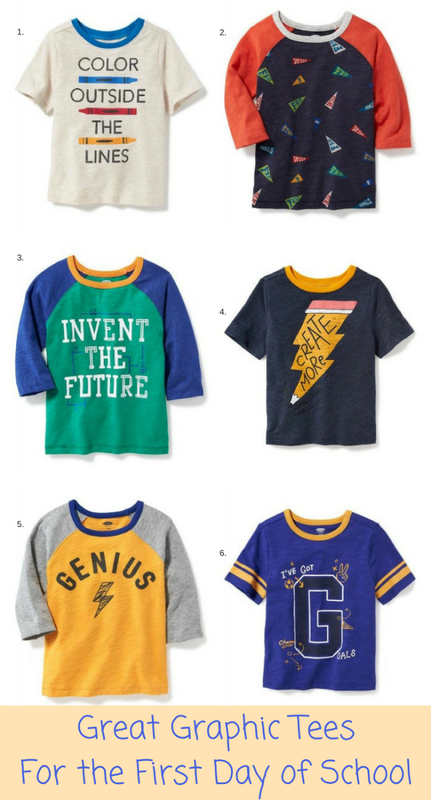 Paired with jeans or khakis, these Instagrammable graphic tee-shirts are perfect additions to your incoming Kindergartner&apos;s collection. Better yet, they&apos;re all super affordable--so you can snag &apos;em all. Sorry, no sneak peek at my little guy in his big first-day outfit! I&apos;m a strict believer that the first-day outfit has to be saved for the real deal! But check our Instagram on Sept. 6 for the final reveal.